Previous work showed that neurons of the CNS are protected against perforin-mediated T cell cytotoxicity, but are susceptible to Fas-mediated apoptosis. In this study, we report that Fas ligand (FasL) expression by neurons is involved in protection against perforin-mediated T cell cytotoxicity. Gene transcripts for FasL were identified in single murine hippocampal neurons by RT-PCR combined with patch clamp electrophysiology, and constitutive expression of FasL protein was confirmed in neurons by immunohistochemistry. Neurons derived from wild-type C57BL/6 (BL6) mice and mutant BL6.gld mice lacking functional FasL were confronted with allogeneic CTLs and continuously monitored in real time for changes in levels of intracellular calcium ([Ca2+]i), an indicator of cytotoxic damage. Perforin-mediated plasma membrane lysis, characterized by rapid, massive [Ca2+]i influx into the target cells within 0.5 h, was not detected in wild-type neurons. In striking contrast, FasL-deficient neurons showed rapid increase in [Ca2+]i within 0.5 h, reflecting perforin-dependent cell lysis. FasL seems to protect neurons by blocking degranulation of CTLs, since CD3-induced release of cytotoxic granules was reduced by coapplication of Fas-specific Abs or rFasL. Cytotoxic T lymphocytes invade the CNS during autoimmune (1) and infectious disease (2). In contrast to other cell types, neurons appear to be protected against CTL attack, and viral persistence in neurons is often the outcome of neurotrophic viral infection (3, 4). It was generally assumed that neurons could fully escape immune surveillance through their inability to express MHC class I and to present peptides to CTLs (3, 4). However, our group and others have demonstrated that neurons are principally inducible to express MHC class I in vitro (5, 6) and in vivo (7). For example, primary hippocampal neurons electrically silenced by the sodium channel blocker, tetrodotoxin (TTX),3 and treated with the proinflammatory cytokine, IFN-γ, do transcribe the genes for MHC class I heavy chain, β2-microglobulin, both TAP transporters, and express MHC class I molecules on their cell surface (8). These data suggest that neurons with overt (viral) damage would have the structural requirements for CTL-mediated cytotoxicity. CTL-mediated cytotoxicity is predominantly mediated via two independent pathways, either: a granule-mediated process involving the pore-forming perforin and proteolytic granzymes or a receptor-ligand interaction inducing apoptosis through Fas (CD95/Apo-1) on the target and Fas ligand (FasL/CD95L/Apo-1 ligand) on the effector cell (9, 10). Recently, we demonstrated that cultured hippocampal neurons induced to express MHC class I and Fas molecules by treatment with IFN-γ and TTX can be killed by peptide-specific CTLs via Fas-mediated apoptosis (11). However, the neuronal cell bodies were protected from perforin-dependent lysis following attack by CTLs (11). In the present study, we analyzed the possible involvement of FasL in protection of individual neurons against perforin-mediated CTL attack. Using single cell RT-PCR and confocal immunohistochemistry, we show that neurons constitutively express gene transcripts and proteins for FasL. Furthermore, we demonstrate that FasL expression by neurons is involved in protection against perforin-mediated CTL effector mechanisms. Finally, FasL molecules are capable of reducing granule release from CTLs triggered by CD3 activation. C57BL/6 and BALB/c mice were obtained from the animal house facilities of the Max-Planck Institute of Biochemistry (Martinsried, Germany). Fas mutant (BL6.lpr, Faslpr) and FasL mutant (BL6.gld, B6-FasLgld) mice were originally obtained from The Jackson Laboratory (Bar Harbor, ME) and then maintained in our animal house facilities. B10.Br (B10.Br/Ola/Hsd) mice were obtained from Harlan-Winkelmann (Barchen, Germany). B10.Br perforin−/− mice were kindly provided by the Institut für Labortierkunde, University of Zurich (Zurich, Switzerland). BALB/c mice were obtained from the animal house facilities of the Max-Planck Institute of Biochemistry. Hippocampal neuronal cell cultures were prepared as previously described (5). Briefly, hippocampi were isolated from whole brains of embryonic day 17 mice (E17), and the meninges were removed. The trimmed tissue was dissociated by trituration through a fire-polished Pasteur pipette. Cells (5 × 104/ml) were plated on dishes that had been pretreated with poly-l-ornithine (0.5 mg/ml; Sigma, Taufkirchen, Germany) in 0.15 M boric acid overnight, followed by laminin (10 μg/ml; gift from A. Ries, Max-Planck Institute of Biochemistry) for at least 1 h. Dissociated neurons were cultured in basal medium Eagle’s (Life Technologies) with B27 supplements (Life Technologies, Karlsruhe, Germany), glucose (1%(v/v) Sigma), and FCS (1% v/v; Pan System, Würzburg, Germany). Neurons were cultured for up to 7 days before being used in the experiments. Thereafter, mouse rIFN-γ (100 U/ml; Laboserv, Giessen, Germany), TTX (1 μM; Sigma), or combinations were added to the cells for 72 h, as indicated in the text or figures. Hippocampi were isolated and dissociated into single cell suspensions, as described for neuronal hippocampal preparations. A total of 1 × 106 to 5 × 106 cells was plated in 50-ml tissue culture flasks that had been pretreated with poly-l-lysine (5 μg/ml; Sigma). Cells were cultured in astrocyte medium containing MEM-d-valine (Life Technologies), 10% heat-inactivated FCS (Pan System), and 1% l-glutamine. Microglial cells were removed by several rounds of shaking on a rotary shaker. Before experimentation, astrocytes were transferred to membrane-bottom dishes for intracellular calcium ([Ca2+]i) analysis or Lab-Tek chamber slides (Nalge Nunc International, Naperville, IL) for immunohistochemistry. Astrocytes were cultured ∼10–20 days before experimentation. Cells were treated with IFN-γ and TTX for 72 h, as indicated. Spleen cell suspensions were prepared from 6- to 8-wk-old mice. Mononuclear cells were isolated over a Histopaque gradient (Sigma), then washed extensively in IMDM supplemented with 2-ME (Life Technologies) and 10% heat-inactivated FCS (Pan System). Br.B10 or Br.B10 perforin−/− splenic mononuclear cells (5 × 106/well) were layered in 24-well flat-bottom plates onto irradiated C57BL/6 splenic mononuclear stimulator cells (5 × 106/well). At day 5 after stimulation, activated cells were recovered from a NycoPrep 1.077 Animal gradient (Nycomed Pharma, Oslo, Norway), washed, and then used for killing assays at an E:T ratio adjusted to 5:1. 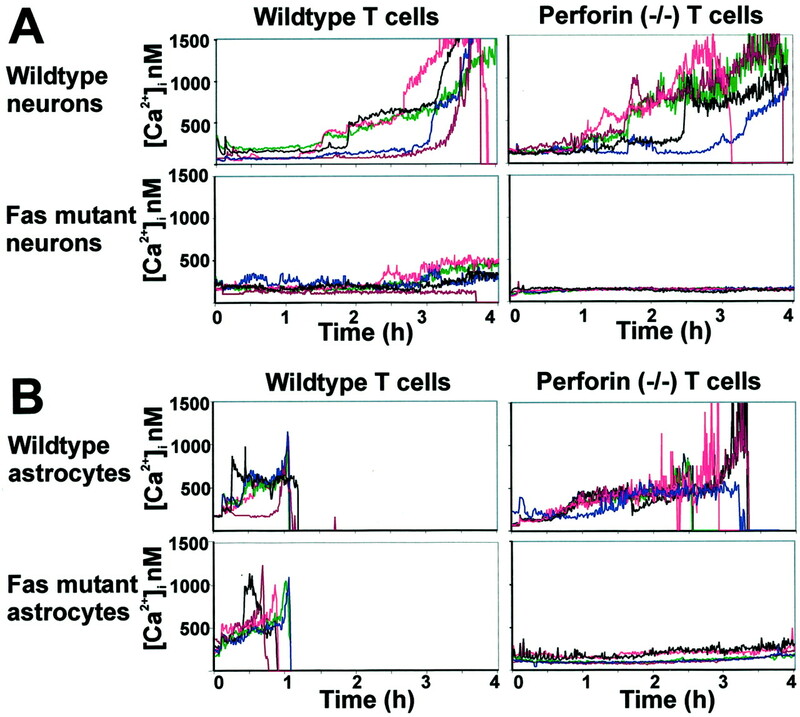 Approximately 50% of the wild-type and perforin−/− effector cells were αβTCR and CD8 positive, as determined by flow cytometry. Furthermore, about one-half of the wild-type effector cells contained perforin, as analyzed by immunohistochemistry. Allogeneic BALB/c and Br.B10 effector cells induced similar [Ca2+]i response profiles in target cells. Isolation of cytotoxic granules was performed as described (12). Cultured hippocampal neurons were treated with CTL-derived secretory granule proteins at a final dilution of 1/40. Experiments were performed in either Locke’s buffer (154 nM NaCl, 5.6 nM KCl, 2.3 mM CaCl2, 1 mg MgCl2, 3.6 mM NaHCO3, 5 mM HEPES, 20 mM glucose) or calcium imaging buffer (see later section without supplementation with BSA or FCS), giving similar results. Cells were analyzed using the Argus-50 video image analysis system for changes in the levels of [Ca2+]i. Cell lysis was determined using the Live/Dead staining kit (Molecular Probes). Cultured hippocampal neurons were treated with hamster mAbs directed against Fas (2.5–10 μg/ml, Jo2; BD PharMingen, Hamburg, Germany), cross-linked with an equal concentration of goat Ab directed against hamster IgG (Dianova, Hamburg, Germany) to enhance the efficiency of the Ab to induce apoptosis. Negative controls consisted of Fas mutant neurons or neurons treated with a cross-linked isotype control. Control treatments did not induce elevated levels of [Ca2+]i. Cells were analyzed using the Argus-50 video image analysis system for changes in the levels of [Ca2+]i (see next section). For measurement of [Ca2+]i, hippocampal neurons and astrocytes were cultured onto 35-mm membrane-bottom dishes (Heraeus, New York, NY). Target cells were loaded for 1 h (37°C, 10% CO2) with 8 μM fura-PE3 acetoxymethyl ester (Calbiochem, Bad Soden, Germany), 2 mM stock dissolved in DMSO/10% pluronic F-12 (Molecular Probes, Eugene, OR), rinsed, and incubated in conditioned culture medium for 15 min before the measurement. Similarly, effector CTLs were loaded with 2 μM fura-PE3 acetoxymethyl ester and washed before the addition to the target cells. T cells were loaded with fura to allow continuous monitoring attachment and detachment of T cells to neurons without switching the optic systems between calcium imaging and phase-contrast microscopy. During [Ca2+]i imaging, cells were kept in calcium imaging buffer consisting of 142 mM NaCl, 5.4 mM KCl, 1.8 mM CaCl2, 0.8 mM MgSO4, 1 mM NaH2PO4, 5 mM glucose, 25 mM HEPES, 0.1% BSA, and 1% (v/v) FCS, adjusted to pH 7.4. TTX was added to the calcium imaging buffer to prevent neuronal cell death due to excitotoxicity. Cells were visualized with a Zeiss Fluar 40 × 1.3 oil objective using an inverted microscope (Axiovert 100; Zeiss, Jena, Germany) and maintained at 37°C using a heated stage. Images of target cells were sampled every 30 s by applying an excitation wavelength of 340 nm for 0.25 s, followed 1 s later by 380 nm for 0.25 s with an ICCD camera (C2400-87; Hamamatsu, Japan) for a total measurement time of 4 h. In total, eight image samples were obtained in succession at both 340 and 380 nm with a standard memory of 256 × 241 pixels/screen (horizontal × vertical). Images were then processed with the Argus 50/CA software (Hamamatsu) to calculate the fluorescence ratio R = F340/F380. Corresponding [Ca2+]i = Kd (R − Rmin)/(Rmax − R) Sf2/Sb2, where the Kd is the dissociation constant for fura-PE3/Ca2+ (269 nM). Rmax and Rmin, the ratios of excitation efficiencies for bound and free fura-PE3 at 380 nm 29, were obtained by treating cells of a sister culture with a salt solution containing 10 μM ionomycin, and subsequently with a Ca2+-low solution containing 2 mM EGTA. Cells were permeabilized with Triton X-100 to release cytosolic dye, allowing the background signal to be measured. Kinetic plots were obtained from ratio values derived from a 5 × 5 pixel area defined in the soma of the target cell. Responsive cells, showing a representative profile for the target population, are displayed in Results. Target cells showing unphysiologically high baseline levels of [Ca2+]i, i.e., >400 nM, before E:T contact were regarded as irreversibly damaged and therefore eliminated from the study. The kinetics and magnitude of [Ca2+]i responses of individual cells in response to effector cells varied considerably. Therefore, to allow a better comparison between the [Ca2+]i responses of individual cells within the same group and cells from different groups, measurements of the [Ca2+]i load (Σ[Ca2+]i) by which the target cells were challenged, were performed. This involved the summation of [Ca2+]i responses in the region of interest of an individual cell that were above baseline levels for each 30-s time value during the 4-h measurement period. At the beginning of each experiment, the [Ca2+]i levels of each target cell were recorded for 5 min before the addition of effector cells to obtain baseline [Ca2+]i levels. The percentage of calcium-responsive cells was defined as: the percentage of cells within a group showing a Σ[Ca2+]i value above a threshold level, at a defined time point. To determine the percentage of early responding cells, the Σ[Ca2+]i value was analyzed 0.5 h after the formation of E:T conjugates with a threshold of 4000. To determine the percentage of late responding cells, the Σ[Ca2+]i value was analyzed at 3 h after the formation of E:T conjugates with a threshold of 400,000. All experiments of target cell [Ca2+]i levels following CTL attack were repeated at least three times. At least 50 cells were analyzed in each experimental group. Single cell RT-PCR was performed as described previously (5). Cytoplasm was sampled from individual cultured cells with a micropipette after electrophysiological recording. Neurons were identified by whole cell recording configuration of the patch clamp technique. The pipette filling solution contained: 135 mM KCl, 4 mM MgCl2, 1 mM EGTA, 5 mM HEPES (pH 7.3). During the procedure, the cells were bathed in a perfusion solution containing: 135 mM NaCl, 2 mM CaCl2, 2 mM MgCl2, 5 mM KCl, and 5 mM HEPES (pH 7.3). Collection of cytoplasm was controlled visually under the microscope. Samples of the extracellular fluid and pipette solution served as negative controls. The content of the micropipette was transferred in a test tube containing DTT (10 mM; Life Technologies), ribonuclease inhibitor (20 U; Promega, Madison, WI), 1 μl hexamer random primer (Roche Molecular Biochemicals, Mannheim, Germany), and the four deoxyribonucleotides triphosphate (0.5 mM; Amersham Pharmacia Biotech, Piscataway, NJ). Moloney murine leukemia virus transcriptase (100 U; Life Technologies) was added to the test tube. The resulting 10-μl mix was incubated for 1 h at 42°C. Single-stranded cDNA was stored at −80°C. Cytoplasmic mRNA of anti-myelin/oligodendrocyte glycoprotein peptide-specific CD4-positive T lymphoblasts was collected through the micropipette and reverse transcribed similarly. Oligonucleotide sequences were selected with the program Primer3 (Whitehead Institute, Massachusetts Institute of Technology, Cambridge, MA). Forward and reverse primer pairs were chosen from two different exons and were respectively: 5′-TCCGCCCCTTCTGCCGATG-3′ and 5′-CACGGAAGGCCATGCCAGTGA-3′for GAPDH; 5′-TGGTGGCTCTGGTTGGAATGGG-3′ and 5′-TGGGCCACACTCCTCGGCTC-3′ for FasL. PCR reaction was done in a final volume of 50 μl containing 1 μl of the transcribed cDNA probe, the four deoxyribonucleotides triphosphated (0.2 mM each; Amersham Pharmacia Biotech), 2.5 U AmpliTaq (PerkinElmer, Norwalk, CT; Roche Molecular Systems), and 1× PCR buffer (PerkinElmer; Roche Molecular Systems) covered with two drops of mineral oil (Sigma). PCR amplification was performed on a programmed thermocycler (MultiCycler; MJ Research, Cambridge, MA). After the cDNA was denatured at 95°C for 3 min, denatured primers (final 100 pmol primers) were added to each tube at 80°C. PCR was performed by 50 cycles (93°C for 1 min; ramp with 0.1°C/s from 93°C to 60°C; 60°C for 1 min; 72°C for 1 min) and followed by one final cycle at 72°C for 5 min. A total of 10 μl of the PCR reaction was loaded in parallel with the m.w. marker (ΦX 174, HaeIII digested; Amersham Pharmacia Biotech) on a 1.7% agarose gel containing ethidium bromide. 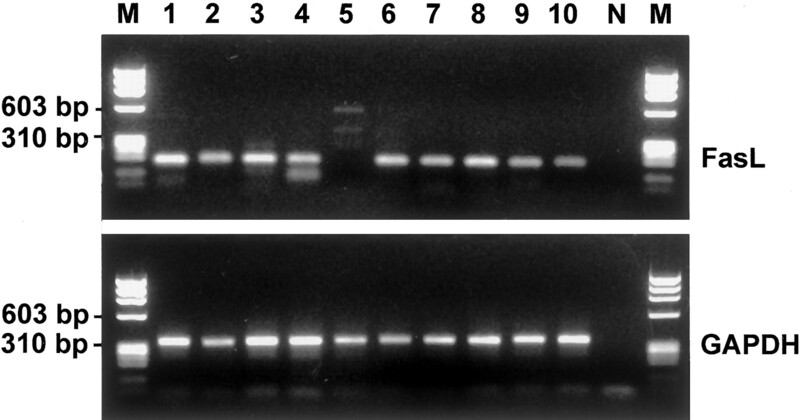 PCR products were purified from ethidium bromide-stained agarose gels using the gel extraction method (Qiagen, Hilden, Germany) and directly sequenced (MediGenomix, Martinsried, Germany). To identify FasL-expressing cells in the hippocampal cultures, cells were washed with PBS, then fixed in 2% paraformaldehyde + 0.05% Triton X-100 for 15 min. Nonspecific binding sites were blocked with 2% goat serum/BSA, then cells were incubated with mouse mAbs directed against CD95L/FasL (10 μg/ml, Kay-10 (BD PharMingen) or 10 μg/ml, F37220 (Transduction Laboratories, Lexington, KY)), followed by a secondary goat Ab directed against mouse IgG (10 μg/ml; Dianova). Cells were then double labeled with either neuronal-specific mouse mAbs directed against MAP-2 or β-tubulin III (10 μg/ml; Sigma) and secondary fluorochrome diaminotriazinylaminofluorescein-conjugated goat Ab directed against mouse IgG (10 μg/ml; Dianova). Background labeling was determined with irrelevant primary isotype control Ab (10 μg/ml, BD Biosciences), followed by secondary Cy3-conjugated Ab. Allogeneic cytotoxic CTLs were recovered from the gradient at day 5 after stimulation, as described above. CTL suspensions (100 μl, 1.5 × 106/ml) were added into each well of a 96-well plate. The plate was precoated with monoclonal hamster IgG directed against mouse CD3 (1 μg/ml; PharMingen), monoclonal hamster IgG directed against Fas (Jo2, 10 μg/ml; BD PharMingen), isotype-matched hamster IgG control (10 μg/ml; BD PharMingen), or purified soluble FasL (rhsSUPERFasL, 10 ng/ml; Alexis, Grünberg, Germany), as indicated in the text and figure. After incubation for 1 h at 37°C, the supernatants were harvested. The amount of released granules was analyzed in the supernatants by measuring the esterase activity. Briefly, 50 μl supernatant was mixed with 0.3 mM 5, 5′-dithiobis-2-nitrobenzoic acid (Sigma) in 100 μl buffer (50 mM Tris, 0.15 M NaCl, 0.01% Triton X-100, pH 7.6), followed by addition of 50 μl 0.3 mM N-benzyloxycarbonyl-l-lysine thiobenzyl ester (Sigma). The OD405 was read with a microplate reader. Neurons were cultured from dissociated hippocampal tissue of BL6 (C57BL/6) mice. Neurons differentiated in culture and their processes formed a dense neuronal network. Cytotoxicity of neurons was analyzed by continuous measurement of [Ca2+]i in the neuronal perikarya, a method allowing distinction between perforin-mediated and Fas-mediated killing (13, 14, 15). First, purified cytotoxic granule extract was applied to the neurons and [Ca2+]i levels were measured over time. Neurons showed an almost immediate [Ca2+]i response, which led to sustained [Ca2+]i concentrations (up to 1000 nM) within 0.5 h. These [Ca2+]i levels oscillated with frequencies of few minutes before the lysis of the neurons. Similar granule-mediated early lysis with increased [Ca2+]i responses within 0.5 h was observed in astrocytes. Second, cross-linked, Fas-signaling Abs (Jo2) were added to neurons, which had been induced to express Fas molecules by treatment with 100 U/ml IFN-γ and TTX (1 μM) for 72 h. A completely different pattern of [Ca2+]i response was triggered by Fas-signaling Abs. While cytotoxic granules induced an early [Ca2+]i response with high [Ca2+]i load within 0.5 h, Fas-signaling Abs induced a delayed [Ca2+]i response with a high [Ca2+]i load within 3 h (Fig. 1⇓). In detail, [Ca2+]i levels stayed in a physiological range between 100 and 300 nM within the first hour. Only after 2–3 h [Ca2+]i, levels gradually increased and reached levels up to 1500 nM after approximately 4 h. No increased [Ca2+]i level was observed in neurons derived from Fas mutant BL6.lpr mice or following application of a cross-linked, hamster isotype control Ab. 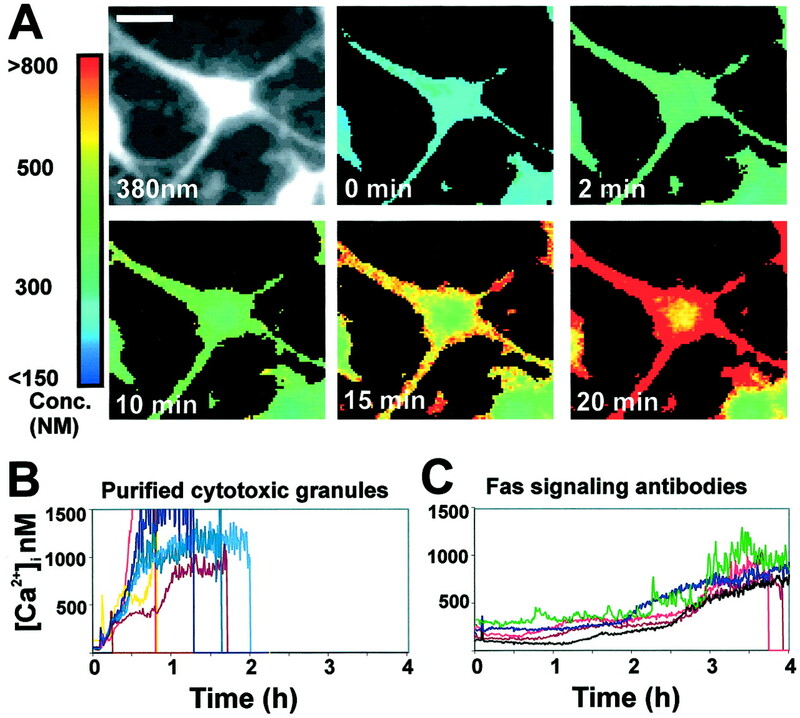 Thus, neurons can, in principle, be killed by both direct application of cytotoxic granules and Fas-signaling Abs, but showed distinct changes in the kinetics of [Ca2+]i levels. Distinct target cell [Ca2+]i profiles in response to perforin-containing granules and Fas-signaling Abs. A, A single neuron treated with purified cytotoxic granule extract. The neuron shows rapid, unphysiological increases in [Ca2+]i starting at the plasma membrane (2 min), penetrating the cytoplasm (15 min), and eventually leading to loss of signal (20 min) due to lysis and leakage of fura dye out of the cell. Scale bar: 20 μm. B, [Ca2+]i response profiles of individual neurons treated with a 40× dilution of granule extract. Each line represents [Ca2+]i levels from the cell somata of individual neurons. Neurons show a biphasic response: a transient increase in [Ca2+]i immediately following the addition of the extract to the culture, followed by a second, more severe increase that does not return to baseline and invariably leads to lysis. C, Induction of apoptosis in paralyzed neurons pretreated with IFN-γ and incubated with cross-linked Fas-signaling Abs. Delayed, sustained [Ca2+]i response in the neuronal somata within 3 h in individual neurons. Each line represents [Ca2+]i levels from the cell somata of individual neurons. Next, neuronal cytotoxicity was studied following attack by CTLs. Allogeneic CTLs derived from BALB/c or B10.Br mice directed against C57BL/6 mice were generated, resulting in activated CTLs typically directed against MHC class I molecules of the C57BL/6 mice. Cell surface expression of MHC class I and Fas on neurons was induced in all experiments by treatment with IFN-γ and TTX for 72 h.
Following the recording of a stable baseline of [Ca2+]i in the neurons, allogeneic CTLs were added to the culture at an E:T ratio adjusted to 5:1. A small [Ca2+]i rise immediately returning to baseline was observed in some target cells at the time of addition of the effector cells, before E:T contact, possibly due to soluble mediators. The CTLs formed conjugates with the neurons, but no elevated [Ca2+]i response was observed in neurons within the first hour, indicating lack of membrane damage (Fig. 2⇓). Neurons showed a delayed and gradual increase of [Ca2+]i, within 3 h, which was sustained at relative high [Ca2+]i concentration (Fig. 2⇓). Different killing mechanisms of neurons and astrocytes following CTL challenge. A, Delayed and sustained [Ca2+]i responses in MHC class I-induced neurons following interactions with allogeneic CTLs, visualized at the single cell level. Neurons from wild-type and Fas mutant mice interacting with CTLs from wild-type and perforin−/− mice. [Ca2+]i responses in wild-type neurons are not induced rapidly after the formation of E:T conjugates, but, rather, increased basal levels are delayed and remain sustained in the soma. B, [Ca2+]i response profiles of responsive astrocytes following the interaction of allogeneic CTLs, visualized at the single-cell level. Astrocytes from wild-type and Fas mutant mice interacting with CTLs from wild-type and perforin−/− mice. MHC class I-induced astrocytes showed rapid, focal, oscillating [Ca2+]i responses following interactions with wild-type CTLs. To allow a better comparison between the [Ca2+]i responses of individual cells, a cumulative quantification of the [Ca2+]i load was performed (summation of all [Ca2+]i responses challenged by an individual target cell). Using this measurement, 63% (±10.7% SEM) of neurons showed an increased [Ca2+]i load, 3 h after challenge with CTLs, while increased [Ca2+]i load was only detectable in 2.4% (±2.3%) of neurons at 0.5 h after addition of CTLs (Fig. 3⇓). 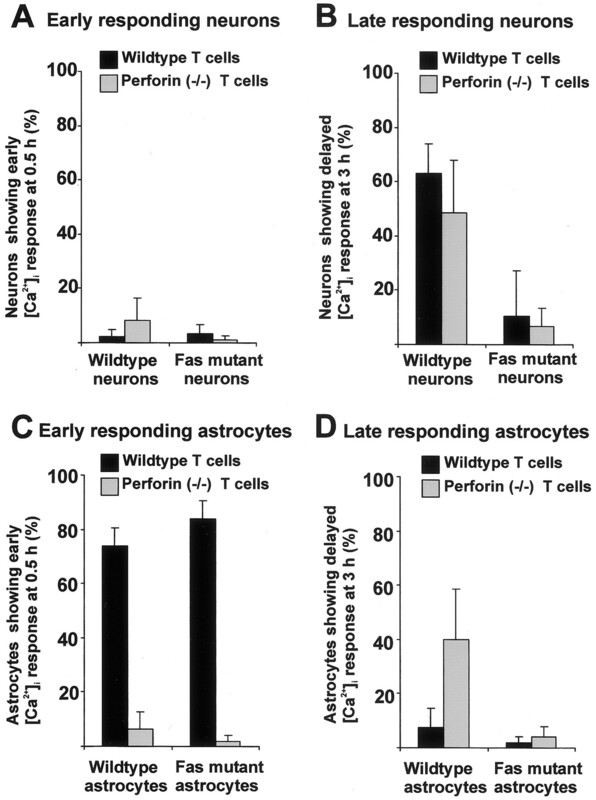 Percentage of early and late responding neurons and astrocytes following CTL attack. The target cells were paralyzed and pretreated with IFN-γ to induce expression of MHC class I and Fas. Early responding target cells showed very high [Ca2+]i responses within 0.5 h, whereas delayed responding cells showed high [Ca2+]i responses at 3 h following attack by allogeneic CTLs. Neurons/astrocytes from wild-type and Fas mutant mice were attacked by CTLs from wild-type and perforin−/− mice. Data are presented as mean ± SEM of at least three independent experiments. Experiments using astrocytes derived from C57BL/6 mice as control target cells and allogeneic CTLs as effector cells were performed. Astrocytes attacked by allogeneic effector cells showed a massive increase in [Ca2+]i within minutes of the formation of stable E:T conjugates (Fig. 2⇑). Subsequently, these cells exhibited a large increase in [Ca2+]i, enough to saturate the fura dye. Later, the fluorescent signal was lost due to leakage of the dye from the cell as a result of plasma membrane damage. In detail, 73% (±6.9%) of astrocytes showed increased [Ca2+]i load at 0.5 h, while only 7.6% (±6.9%) of astrocytes demonstrated increased [Ca2+]i load at 3 h (Fig. 3⇑). Thus, [Ca2+]i response profiles in neurons were substantially different to astrocytes (Figs. 2⇑ and 3⇑). The delayed [Ca2+]i response in neurons was very suggestive of a Fas-mediated apoptosis, while astrocytes showed the typical granule-mediated early [Ca2+]i response. Neurons from B6.lpr mice carrying the Fas mutation were used as targets to confirm that the Fas pathway was responsible for the delayed increase of [Ca2+]i in neurons. Indeed, Fas mutant neurons interacting with allogeneic effectors did not show a delayed and sustained [Ca2+]i increase, demonstrating a complete protection against CTL attack (Fig. 2⇑). In detail, Fas mutant neurons attacked by allogeneic effectors were only 3.2% (±3.7%) at 0.5 h and 10.3% (±17%) at 3 h calcium responsive in respect to increased [Ca2+]i load (Fig. 3⇑). In contrast, the early astrocytic [Ca2+]i response was independent of the Fas expression, and early [Ca2+]i responses were also observed in astrocytes (48.5% ± 6.7%) lacking functional Fas following attack by CTLs (Figs. 2⇑ and 3⇑). Next, target cells were challenged with perforin-deficient CTLs. Neurons interacting with allogeneic effectors from perforin−/− mice showed the same delayed and sustained increase in [Ca2+]i like that observed from perforin-competent allogeneic effectors (Figs. 2⇑ and 3⇑). In line with these findings, Fas mutant neurons attacked by perforin−/− CTLs showed no increased [Ca2+]i load (Fig. 3⇑). While neuronal [Ca2+]i responses were independent of perforin, astrocytic [Ca2+]i response changed the kinetics after attack by perforin-deficient CTLs. The early [Ca2+]i response at 0.5 h was missing in astrocytes attacked by effector cells lacking perforin (Figs. 2⇑ and 3⇑), confirming that astrocyte cytotoxicity was primarily mediated by a perforin-dependent process. However, astrocytes that had been attacked by perforin−/− CTLs were not completely protected from killing. The [Ca2+]i response profile of astrocytes attacked by perforin−/− CTLs was delayed in onset and turned out to be Fas mediated (Fig. 2⇑). Fas mutant astrocytes attacked by perforin−/− effectors showed almost no increased [Ca2+]i load. Thus, astrocyte cytotoxicity is primarily mediated via perforin, and only in absence of perforin do astrocytes exhibit signs of Fas-mediated signaling. However, neurons are protected against perforin-mediated cytotoxicity following CTL attack, but are susceptible to Fas-mediated apoptosis. In an attempt to find molecules that could protect neurons against CTL-induced lysis, we analyzed FasL expression in neurons. Cytoplasm was collected with a micropipette from individual cultured cells, a procedure that allows identification of neurons by patch clamp electrophysiology. Single cell PCR was performed with cDNA transcribed from cytoplasmic RNA. With this approach, gene transcripts for FasL were amplified from individual neurons (Fig. 4⇓). The nature of the amplified neuronal PCR product was confirmed by direct sequencing. The sequence was identical to the published FasL sequence. In total, 22 of 27 (81%) neurons transcribed the FasL gene. 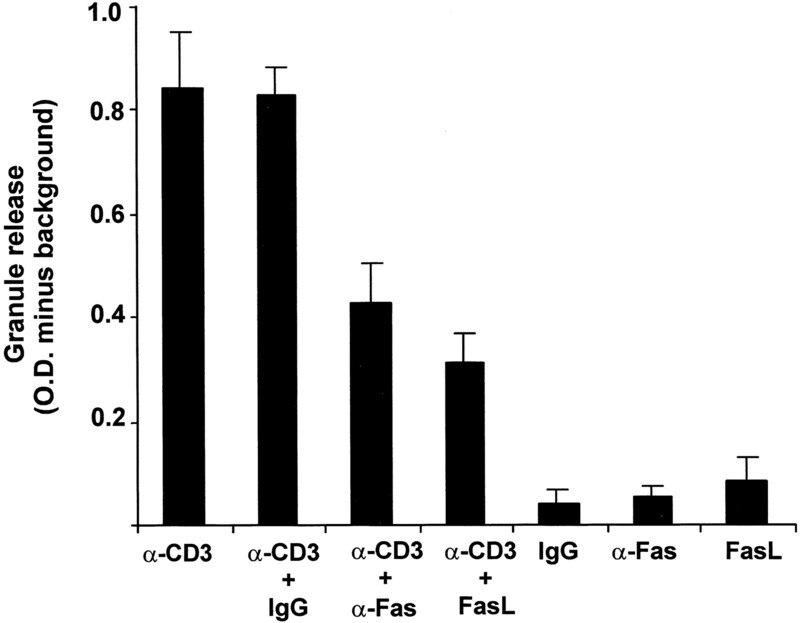 As a positive control, FasL gene transcripts were analyzed in single CD4-positive T lymphoblasts. The majority of T lymphoblasts (9 of 10) transcribed FasL genes. In contrast, detection of FasL in astrocytes was rare, and only 3 of 10 individual astrocytes transcribed the FasL gene. Gene transcripts for FasL and GAPDH amplified by single-cell RT-PCR from individual neurons. In total, 9 of 10 neurons analyzed in this experiment showed a FasL PCR product. M, m.w. marker ΦX 174 HaeIII dig. ; N, negative PCR control. Expression of FasL molecules was confirmed by immunohistochemistry combined with confocal scanning microscopy of fixed neurons using two different mAbs directed against FasL. Neurons were identified by double labeling with Abs directed against the lineage-specific cytoskeleton protein β-tubulin III. Both mAbs directed against FasL demonstrated immunolabeling by confocal laser microscopy. In total, 88% of neurons immunolabeled with the specific Ab (Kay-10) were shown to express FasL without any treatment. The FasL immunoreactivity was localized in intracellular vesicles, predominantly in the soma (Fig. 5⇓). Pattern of FasL expression in neurons was not altered following the treatment regime with TTX and IFN-γ. Again, the majority of neurons showed vesicular FasL expression in the perikarya. Confocal laser scanning microscopy of FasL expression in murine hippocampal neurons. Identification of neurons with an Ab against a neuronal-specific cytoskeleton protein, β-tubulin III. Constitutive FasL expression was predominantly detectable in the neuronal somata following immunolabeling with mouse mAb directed against FasL (Kay 10 Ab). Covisualization of both images from one optical section. Scale bar, 25 μm. To determine whether FasL expression on murine hippocampal neurons protects against early, rapid CTL attack, MHC class I-induced neurons lacking functional FasL derived from gld mice were analyzed. In contrast to FasL competent neurons, FasL mutant neurons derived from BL6.gld mice showed early, rapid [Ca2+]i response profiles, suggesting a lack of protection against granule-mediated killing (Fig. 6⇓). High [Ca2+]i load was detectable at 0.5 h in 62% (±14.2%) of FasL mutant neurons, while wild-type neurons did not show increased [Ca2+]i load at this early time point (Fig. 7⇓). To confirm the involvement of the granule release-mediated mechanism in this early response, FasL mutant neurons derived from BL6.gld mice were subjected to attack by perforin−/− allogeneic effector cells. These neurons displayed the delayed, and sustained [Ca2+]i profile (Fig. 6⇓). Only 5.9% (±3.2%) of FasL mutant neurons attacked by allogeneic perforin-deficient CTLs showed an early increase in [Ca2+]i load at 0.5 h, while 80% (±6.4%) of neurons demonstrated a delayed increase in [Ca2+]i load at 3 h with this setup (Fig. 7⇓). The [Ca2+]i response profile of FasL mutant astrocytes following CTL attack was indistinguishable from wild-type astrocytes. Different mechanisms of killing MHC class I-induced neurons analyzed by measurements of [Ca2+]i at the single-cell level. Neurons from wild-type and FasL mutant mice interacting with CTLs from wild-type and perforin−/− mice. [Ca2+]i responses in wild-type neurons are not induced rapidly after the formation of E:T conjugates, but, rather, increased basal levels are delayed and remain sustained in the soma. In contrast, [Ca2+]i responses in FasL mutant neurons showed rapid, focal, oscillating [Ca2+]i responses following interactions with wild-type CTLs. Percentage of early and late responding MHC class I-induced neurons following CTL attack. Neurons from wild-type and FasL mutant mice were attacked by CTLs from wild-type and perforin−/− mice. Early responding neurons showed very high [Ca2+]i responses within 0.5 h, whereas delayed responding neurons showed high [Ca2+]i responses at 3 h. Neurons from wild-type and FasL mutant mice were attacked by CTLs from wild-type and perforin−/− mice. Frequency of FasL mutant neurons showing early [Ca2+]i responses at 0.5 h was significantly (p < 0.1; two-tailed, unpaired Student’s t test) increased compared with wild-type neurons. Data are presented as mean ± SEM of at least three independent experiments. After having observed that FasL of neurons protects them against perforin-mediated lysis, we analyzed whether Fas of T lymphocytes inhibits the release of cytotoxic granules containing perforin. Release of cytotoxic granules from allogeneic T lymphocytes was induced by cross-linking CD3 with Abs coated on a culture plate. The amount of released granules was determined 1 h after stimulation by measuring esterase activity in the supernatant. The effect of FasL on CTLs was analyzed by coating the plates with rFasL or Fas-specific Abs in addition to CD3-specific Abs. Stimulation of CD3 on allogeneic CTLs for 1 h induced release of cytotoxic granules. Simultaneous activation of Fas molecules with Abs or rFasL reduced the amount of cytotoxic granules released by the CTLs (Fig. 8⇓). The measured esterase activity decreased from 0.83 (±0.05 SEM) to 0.43 (±0.09) following costimulation with the Fas-specific Jo2 Ab. Coapplication of soluble FasL (10 ng/ml) reduced the esterase activity to 0.31 (±0.06). Thus, FasL substantially reduced the release of cytotoxic granules from CTLs following CD3 engagement. Measurement of granule release triggered by hamster mAbs directed against CD3. Esterase activity was measured with the N-benzyloxycarbonyl-l-lysine thiobenzyl ester reagent from culture supernatant to determine the amount of released cytotoxic granules. Allogeneic CTLs were added to culture plates for 1 h, which have been precoated with Abs directed against CD3 (α-CD3), Abs directed against Fas (α-Fas), isotype-matched control Abs (IgG), or recombinant FasL (FasL). Abs directed against Fas as well as rFasL significantly reduced (p < 0.1 and p < 0.05, respectively; two-tailed, unpaired Student’s t test) the amount of cytotoxic granules released by CD3 triggering. Data are presented as mean ± SEM of at least three independent experiments. Background signal was subtracted from the measured values. We analyzed T lymphocyte cytotoxicity against neurons using real time measurements of [Ca2+]i levels. Standard cytotoxicity assays, such as 51Cr release assays, cannot be applied to neurons because of high spontaneous isotope release. In addition, this classic approach does not exclude interference with possible glia contamination. It also does not allow distinction between cell death mediated by Fas activation and cytotoxic granules. Measurement of [Ca2+]i concentrations can circumvent such difficulties and was successfully applied by several groups to study cytotoxicity (13, 14, 15, 16). Confirming our previous data with viral peptide-specific CTLs (11), we observed susceptibility of neurons to Fas-mediated apoptosis, while we did not detect typical early perforin-mediated effects of CTLs at the neuronal cell bodies. Gene transcripts for FasL were detected in neurons of the central and peripheral nervous system by in situ hybridization (17, 18). In addition, FasL expression was observed in neurons of the brain by immunohistochemistry during ischemia (19) and following injury (18) and in neurons of the enteric nervous system (20). Furthermore, gene transcription and protein expression of FasL were detected on particular tumors (21), too. In vivo data demonstrated that tumorigenesis of FasL+ melanoma cells was delayed in Fas-deficient lpr mutant mice compared with wild-type mice (21). These and other observations led to the hypothesis that FasL expression within the target tissue might deplete invading lymphocytes by apoptosis. This concept was not supported by our recent study, in which we analyzed the effect of FasL-expressing neurons on the survival of CD4-positive T lymphocytes (18). The T lymphocytes underwent apoptosis following coculture with FasL-expressing rat hippocampal neurons, but only a minority of the T lymphocytes were rescued by inhibiting the Fas-FasL interaction with Abs (18). Other work showed that several T cell lines do not undergo apoptosis after confrontation with FasL-expressing tumors or APCs (22, 23), also suggesting a distinct mechanism for the FasL-dependent immunodeviation observed in vivo (21). Our data show that gene transcripts and FasL molecules are expressed in cultured murine hippocampal neurons. Furthermore, they demonstrate that FasL protects neurons against a direct CTL-induced and granule-mediated membrane lysis under regular conditions. This phenomenon could be principally a consequence of molecular inactivation of perforin granules by neurons. However, we and others (6) showed that differentiated neurons derived from wild-type and lpr mice (unpublished observation) can be lysed by direct application of cytotoxic granules. Thus, our observation that neurons are protected against perforin-mediated CTL lysis could only be explained by two possibilities: either FasL blocks granule release from CTLs and/or FasL kills CTLs, which are not required for sustained and Fas-mediated neuronal death. Release of cytotoxic granules from T lymphocytes is triggered within a few minutes via TCR/CD3 signaling. Simultaneously, FasL of neurons might interact with Fas molecules on T lymphocytes. The time kinetics we observed suggests that FasL of neurons might induce functional unresponsiveness of interacting lymphocytes within minutes, before the onset of apoptotic death. Furthermore, the protective function of FasL selectively acted on perforin-mediated lysis, eliminating solely one effector pathway, while Fas-mediated cytotoxicity of the CTL remained intact. In principle, FasL of dead CTLs might be capable of binding to Fas receptors on neurons and trigger apoptosis. Simultaneously, FasL of neurons might bind to Fas on the CTLs and inhibits perforin-mediated lysis. Supporting a protective role of FasL of neurons, we show that Abs directed against Fas as well as recombinant activating FasL reduce the amount of granules released by CTLs following CD3 engagement. Thus, simultaneous activation of Fas on CTLs inhibited their granule-mediated effector function. Interference of Fas and TCR/CD3 signaling pathways has been observed in several studies. For example, stimulation of Fas with Abs blocked T lymphocyte calcium channels and IL-2 synthesis (24). In another study, cross-linking of the Fas Ag suppressed the CD3-mediated signal transduction of T lymphocytes (25). Most interesting, an inhibitory (immunoreceptor tyrosine-based inhibitory motif) signaling sequence, which is known to interfere with TCR/CD3-activatory (immunoreceptor tyrosine-based activation motif) signaling events, is present in the intracellular region of the Fas molecules (26). Thus, a principal structural basis for involvement of FasR activation in selective T cell unresponsiveness is given. Inhibition of perforin-mediated cytotoxicity as a neuroprotective mechanism of neuronal cell bodies may have considerable clinical consequences. Granule-mediated cell lysis is a perforin-dependent process and an important mechanism for viral clearance and immunity against viral infection. Thus, perforin−/− mice have increased susceptibility and general failure to clear noncytopathic viruses (27). Protection of neurons against CTL-mediated lysis would favor viral persistence. Indeed, pioneering work of Oldstone and colleagues (28) has demonstrated that the mode of viral clearance in the CNS is different from other sites, often resulting in viral persistence in neurons. This might be a consequence of two synergistic neuroprotective mechanisms. First, neurons show a strictly controlled MHC inducibility (3, 8). Second, our data now suggest that neurons are protected against granule-mediated cytotoxicity. 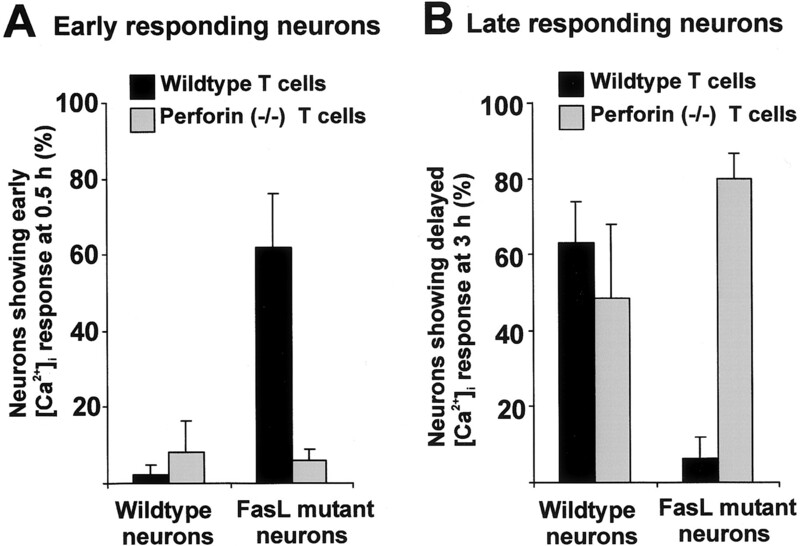 Why should neurons escape perforin-mediated CTL attack, risking viral persistence? Due to their postmitotic situation, most neurons in the CNS are not replaceable after cell death and have a very low regenerative potential. Therefore, both mechanisms restricted MHC inducibility and FasL expression, and could have emerged in evolution to prevent unwanted CTL-mediated neurodegeneration. We thank Drs. Rolf Zinkernagel and Hans Hengartner for continued support. We are grateful to Lydia Penner for technical assistance. We thank Dr. Dieter Jenne for helpful discussions. ↵1 This work is supported by Deutsche Forschungsgemeinschaft (DFG SFB 391) and by the Volkswagen-Stiftung. ↵2 Address correspondence and reprint requests to Dr. Harald Neuman, Department of Neuroimmunology, Max-Planck Institute of Neurobiology, Am Klopferspitz 18 A, 82152 Martinsried, Germany. ↵3 Abbreviations used in this paper: TTX, tetrodotoxin; [Ca2+]i, intracellular calcium; FasL, Fas ligand. Rall, G. F., M. B. A. Oldstone. 1995. Virus-neuron-cytotoxic T lymphocyte interactions. M. B. A. Oldstone, and L. Vitkovic, eds. HIV and Dementia: Proceedings of the NIMH-Sponsored Conference on Pathogenesis of HIV Infection of the Brain: Impact on Function and Behavior 261-273. Springer-Verlag, Heidelberg.